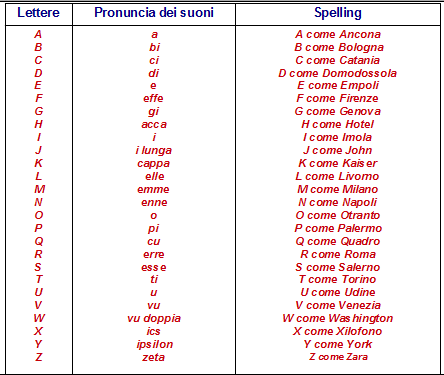 HERE BELOW YOU’LL FIND THE ITALIAN ALPHABET AND ITS SPELLING. IT IS USEFUL WHEN YOU SPEAK ON THE PHONE OR WHEN YOU HAVE TO SPELL YOUR NAME IN ITALIAN! NOTE, THAT YOU USE TOWNS TO NAME THE LETTERS.